Spring has sprung as they say and I am feeling motivated to tackle all the projects I have been brainstorming during the winter months. Project #1…..the laundry room. Two story homes can have a laundry room on the first or second floor each offering their own benefits and downfalls. Sometimes I envy those who have the convenience of their second floor bedrooms on the same level as their laundry room. I can imagine how nice it would be not having to lug laundry up and down stairs multiple times a week. That being said, having my laundry room on the first floor allows the dual purpose of a mud room with the added benefit of not hearing the laundry running while I sleep. One of my goals this spring is to make my first floor laundry room functional and efficient for my family. I will share the ideas I implemented but would love to hear yours as well! 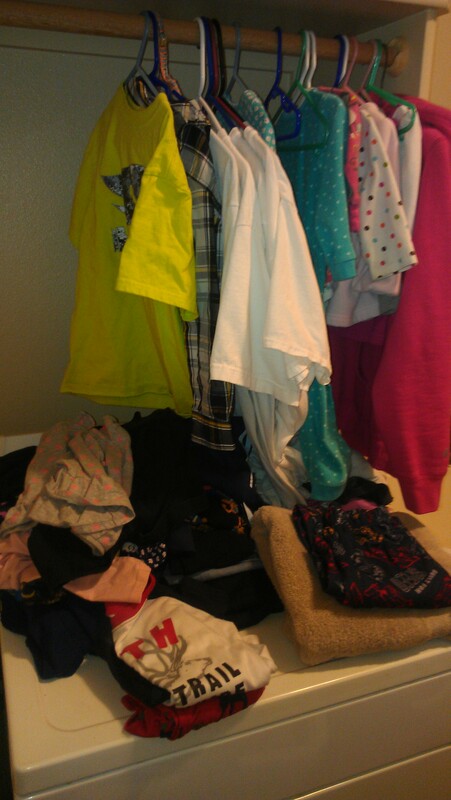 As you can see in my before image, I used to fold laundry as I took it out of the dryer doing my best to keep it in piles for each person in our home. I then either had each family member take a few trips up the stairs or put it all in one basket (heavy) and did it on my own. My solution….I bought tubs for each member of my family. As I fold laundry, I put each person’s clothes in their own tub. The result, my laundry room looks more organized and my children can carry their own laundry to their rooms in one trip up the stairs. Not a bad outcome! For hanging items such as shirts, I bought hangers in three different colors. Each child has a color so I no longer have to spend time sorting through who’s shirts are who’s after they are all hung. A bit over the top?! Maybe, but it has worked for us so far! The second problem I faced was shoes thrown on the floor as the children and husband came in from outside. I purchased an ottoman that functions as a hiding place for shoes as well as a place to sit to put shoes on. 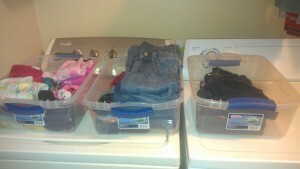 I would love to hear how you have made your laundry room organized and efficient! Reply to this post and let’s get organized together this spring!